The most investigated case in the history of the Burke County Sheriff's Office remains unsolved. The shooting death of Rhonda Annette Hinson, an attractive 19-year old from Valdese, continues to frustrate detectives assigned to solving a crime which has no apparent motive. On the evening of Tuesday, December 22, 1981, Rhonda attended her office's (Hickory Steel Company) Christmas party at the American Legion Hut in Hickory. After leaving the party around midnight, she stopped by a friend's house to pick up her vehicle and call her boyfriend. After leaving the friend's residence, Rhonda drove her beige Datsun 210 two-door west on Interstate 40 and exited onto the Mineral Springs Mountain/Highway 350 off-ramp. She turned right (north) and began traveling up a steep hill toward her home when a high powered rifle projectile was fired into the vehicle. 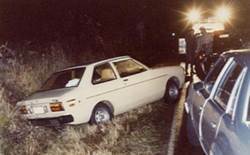 The bullet entered the Datsun through the trunk and continued through the back seat and driver's side seat, entering Rhonda's back and piercing her lung and heart. Rhonda was found lying in a ditch beside the open driver's side door of her Datsun. She was less than a mile from the home she shared with her parents in Valdese. The vehicle was running and apparently had rolled backwards across the opposite lane into a ditch near the top of the grade after Rhonda was shot. Numerous questions shroud Rhonda's death. There are medical opinions which feel she would have been rendered incapacitated after being shot, yet her body was found outside the vehicle. Did the assailant pull her body from the car? Did Rhonda know her assailant? Was this an act of random violence or a case of mistaken identity? Was anyone in the company of the shooter? What was the motive behind firing the fatal shot? Throughout the years, hundreds of persons have been interviewed by investigators assigned to the case. The file on the Hinson murder contains thousands of documents and has expanded to fill several filing cabinets. Potential suspects and witnesses have been polygraphed; psychics have been called in to assist; the crime scene and evidence have been analyzed and re-analyzed; yet Rhonda's death and the strange circumstances around it remains a mystery. The Hinson case was featured on the NBC television program "Unsolved Mysteries" in 1989. The program was filmed on location at the actual site where the crime occurred, and many of those involved with the case portrayed themselves. Hoping to gather new information, investigators flew to Los Angeles and fielded telephone calls immediately after the piece was aired. Although the documentary was well produced and meticulous attention was given to ensure accuracy during filming, the new leads developed from telephone calls across the country led to dead ends. On January 8, 1982, Governor James B. Hunt issued a proclamation offering a $5,000.00 reward for information in this case that will bring the killer to justice. The town of Valdese is also offering a $5,000.00 reward. Along with funds set aside by Morganton-Burke Crimestoppers and private donations and pledges, the reward exceeds $20,000.00. Rhonda's parents, Bobby and Judy Hinson continue to seek answers. They are frequently in touch with Sheriff McDevitt and investigators who are assigned to work the case, their lives shattered by this cowardly act. If life were fair, they would be spending time with the children Rhonda never had the opportunity to bear, rather than repeating trips to the Sheriff's Office. In regards to the killer, they often wonder, "Does he or she have a conscience?" It is their hope that Rhonda's assailant (or an accomplice/person having knowledge of this crime) will one day understand the heartache they feel from losing a child in such a senseless manner. If the killer does have any semblance of a heart and is not the cold, callous person as many perceive, perhaps one day he/she will face up to their deed and provide the answers they deserve. To report information concerning the case of Rhonda A. Hinson, contact Lt. Becky Weatherman of the Burke County Sheriff's Office at (828) 438-5506, or Crimestoppers at (828) 437-3333. The e-mail address for the Sheriff's Office's Administration is admin@burkesheriff.org. Remember, you may call anonymously and be eligible for the reward money listed above if your information leads to the arrest and conviction of Rhonda's killer.